How strong is your Kung Foon my friend? An interesting name for an interesting product. 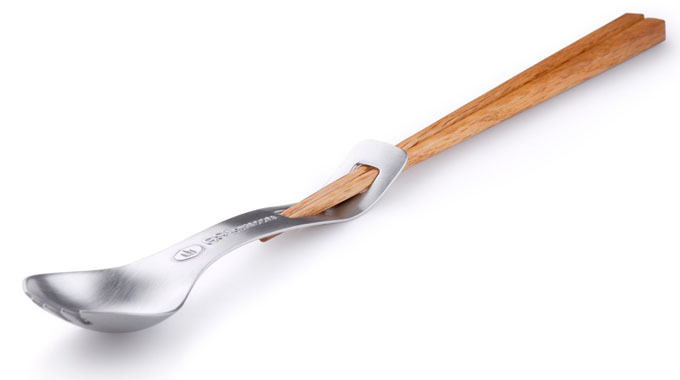 This is truly “spork meets chopsticks” to create a lightweight portable multi-function utensil. Your chopsticks simply slide into the Foon’s handle making the perfect piece of cutlery to reach the bottom of a rehydrated food pouch or to stir a pot. Because it’s a spork you have the function of spoon and fork as well. It is made of stainless steel and comes in a steel gift carrying tin with a set of plastic chopsticks. Perfect for the camping trips or in your bag for lunches at work.